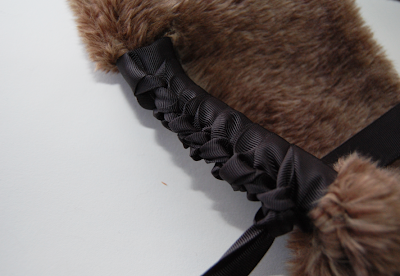 The ribbon was weaved around a section of fabric to give a fishtail braid effect. Keep reading for closeups and instructions! 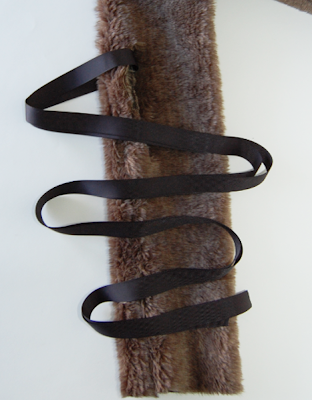 - Ribbon, about 100 inches. My ribbon was 7/8inch wide. 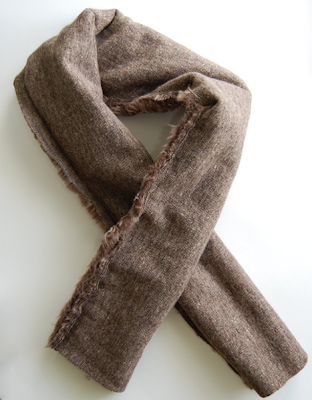 This scarf can certainly be made without a sewing machine, but if you have basic sewing skills and access to a sewing mahcine - I strongly suggest that you use it. 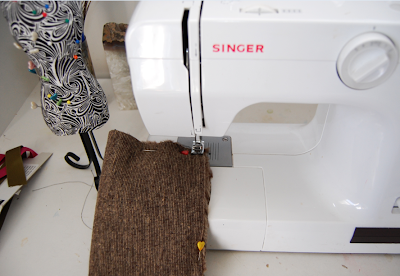 Hand sewing will take a little longer, but still is an option. Whatever you're comfortable with! 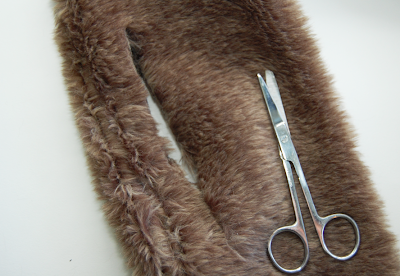 1) Fold your strip of fur lengthwise, so that the back side is facing out. Pin along the edges. 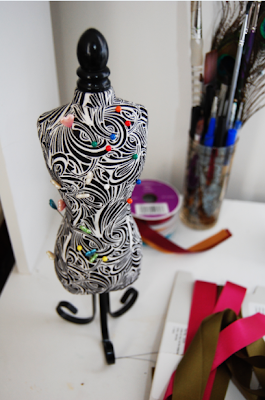 Side note: I adore my pincushion - it's about 12 inches high and is in the shape of a dress form. Love. 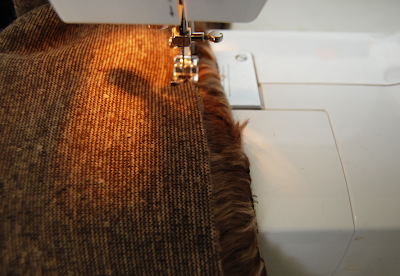 If you decide to hand sew, a tight basic running stitch along the edges should work fine. 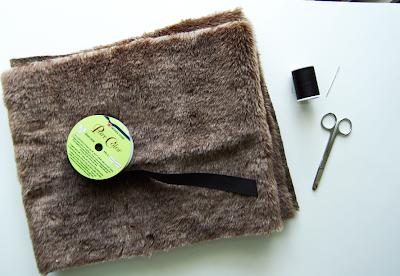 This is what the scarf will more or less look like when you're done sewing. 3) Turn it right side out. This may be a little tricky at first because the fabric is so thick, but it's definitely doable! Just be patient with it. 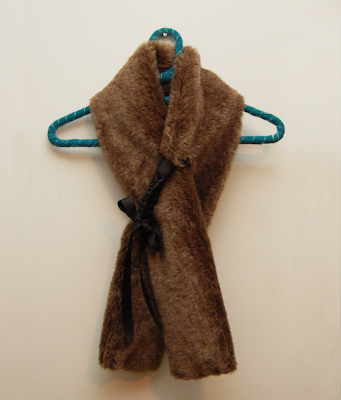 4) Wrap the scarf around your neck and figure out where you want to slip on end of the scarf into the other. 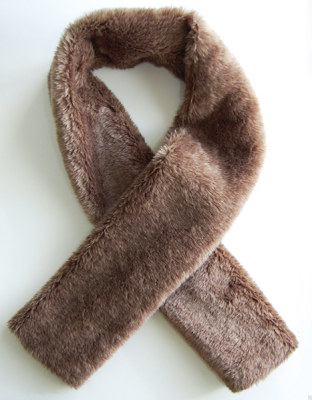 Keep in mind the scarf won't be adjustable because of this. You can follow my measurements if you'd like: a 5.5 inch long slit, 10 inches away the bottom, ~1.5 inches away the side. Make sure you cut through both layers. THIS...is actually what I wanted to originally make. No extra details, just this. 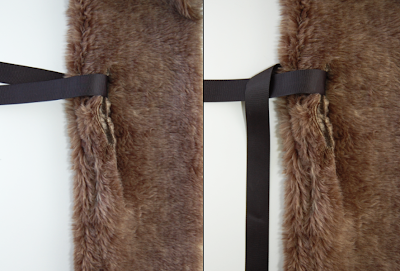 I knew I'd have to finish off the two edges of the slit, so I thought, why not make it a little fun with some ribbon? That way, there's the gorgeous braided detail and I only have to sew one edge. I used black grograin ribbon. I wish I had some black or turquoise silk ribbon, but I already had this on hand; the great thing about scarf is that I can easily change the ribbon at any time. 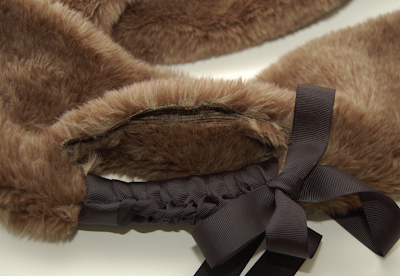 5) Slip the ribbon through the slit. Make sure it's at the very top of your cut, and that there is an equal amount of ribbon on each side. 6) Position the ribbon like I did in the first picture; take the bottom strand and fold it over the top strand. 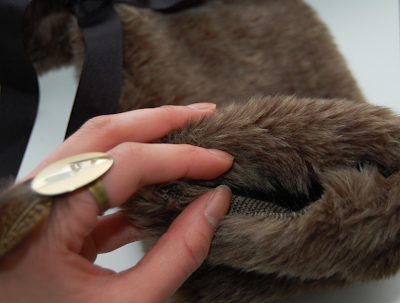 7) Take this strand and slip it under the fur and through the slit. 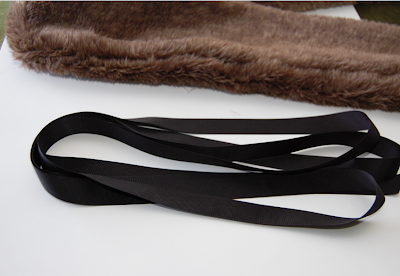 (The side of the ribbon that was originally facing down should now be facing the fur.) 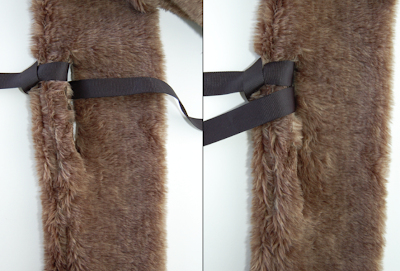 After the ribbon goes through the slit, take it back over the fur - like in the second picture. Your ribbon will be placed similarly to the first picture in step 6. So with that said - keep repeating steps 6 & 7! 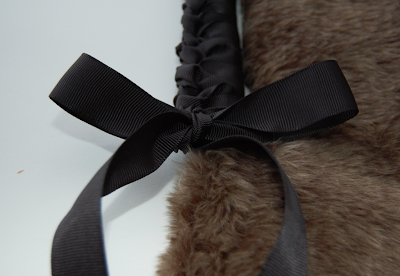 Every time you pull the ribbon through the slit in the fur, make sure you pull it tightly. If it's too loose, the braid won't form properly. 8) After repeating Steps 6 & 7, this is what the finished braid should look like. 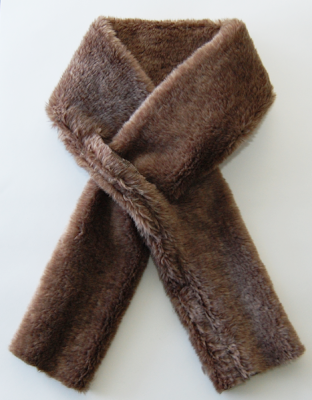 9) Tie it off with a bow, and trim as desired. If you'd like, add a little hot glue in the center of the bow to secure it. 10) As for the ends, I folded them in and the whip stitched across the edge. 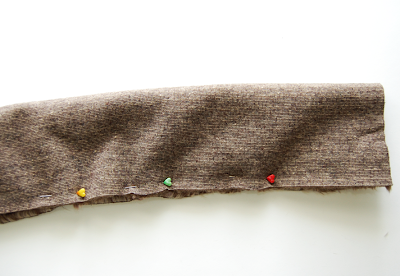 11) I sewed up the other edge of the slit using a whip stitch and a running stitch.